My second of four days in San Francisco was just as long and eventful as the first. I woke up Saturday morning at about 8:30, in far less pain than I thought I would be after a long Friday urban hike. I took a quick shower and once again hit the pavement. After a little looking around in Chinatown again and a quick breakfast at Caffé Puccini, I headed for a bike rental shop. My plan was to bike along the water and over the Golden Gate Bridge to Sausalito, then grab a ferry back. Hopefully I could do all of that and still squeeze in a short rest before joining some local friends for a beer hike. The bike ride was pretty taxing for me. The fog on the bridge was thick as can be, so there was no point in going all the way across. I couldn't see anything so I only took a few snapshots and turned back about 1/3 of the way across. Typically, just as I was returning the rental bike, the fog broke and the sun came out. If I'd left an hour later, the view from the Bridge would have been spectacular. My hiking partners Merideth and Chris from thebeergeek.com wrote up a nice recap of our hike here. (I've also reprinted it below with their permission because I'm lazy and really behind on my posts.) Thanks geeks! We’re not unfamiliar with walking all over a city visiting pubs, brewpubs and breweries. From our earliest days of beer travel, this was our favorite mode of transportation. Turns out, there is a whole website devoted to this mode of beer crawl, urbanbeerhikes.com. Thanks to our friend, Chris, we met the website’s owner and urban beer hike guru, Dave, for a Saturday hike around San Francisco. On a pleasant early November day, our five-some began the hike at City Beer Store. The quintet included Dave, Chris, Renee, Merideth and myself. This was Dave’s first visit to the City so we would be covering familiar ground on our hike. The beers that began our day included Russian River Redemption, Jolly Pumpkin La Parcela, Auburn Alehouse Festbier and Bear Republic "Mach 10". With a good base of beers, it was time to find some food. In a city where walking can can be quite vertical and challenging, our journey to the Public House at AT&T Park (1.4 miles) was typical of what we mostly would experience on the day, nice and flat. In contrast to the previous week’s World Series bedlam and subsequent celebrations, the Public House was relatively quiet on this Saturday afternoon. While most of our crew ordered the house cask beer, Billy Sunday Bitter, Merideth began with Firestone Walker’s Velvet Merlin Oatmeal Stout. 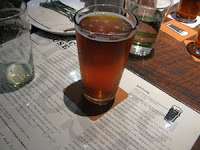 Accompanying the beers at the Public House where high-end pub grub items such as Mac-n-cheese, Pulled Pork Sliders, a BLT and Humphry Slocombe Ice Cream. It was a short walk to 21st Amendment (.4 miles). Where the Public House was quiet, 21A was buzzing with activity. We ended up grabbing a table up in the loft. 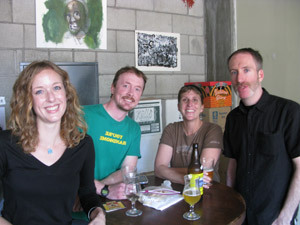 It was the first week of the BRU/SFO Project, the Belgian-inspired brews month at both 21A and Magnolia. There were three BRU/SFO creations available on our visit. Merideth and I both passed on the cocoa Witbier to try Via, a really nice Belgian-style Single. 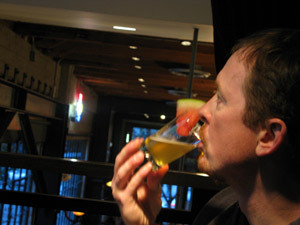 Our valiant leader, Dave, couldn’t turn down an opportunity to have Watermelon Wheat with a slice a watermelon. After 21A, we had the longest leg of the day, a 1.8 mile walk to North Beach. If there are any hills on this hike, it would be the walk up Columbus Ave. After a quick stop at Golden Boy Pizza for some more food, we walked around the corner to Church Key. Church Key is one of my favorite beer spots in the City. I just love the laid back neighborhood atmosphere of the tiny bar. Unfortunately, on this evening, the beer selections excited no one in our group. So, we were ‘one and done’. From the quiet Church Key, it was another short walk (.4 mile) to the opposite end of the spectrum, the loud and boisterous La Trappe. Descending the stairs into the cellar, we were greeted by a din of noise from an almost packed house. Luckily, we found a few seats at the bar. Another one of my favorite beer destinations in the city, I could only manage a St. Bernardus Christmas beer before the Saturday night crowd got the best of us. Looking back, La Trappe maybe should have been our first North Beach stop. We finished the evening at Specs’ Twelve Adler Museum Cafe, the first new place of the day for Merideth and me. Better known as just Specs’, this old-school dive bar was only a half mile from La Trappe. Like any good dive, Specs’ was located down a alley. 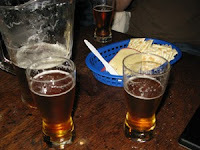 We found a table in the very, very dim bar and ordered a pitcher of Sierra Nevada Pale Ale. To accompany our beer, Merideth ordered a wedge of cheese and saltines. After spending the day at the higher end of the San Francisco beer scene, munching on cheese and saltines chased with Pale Ale in a dimly lit bar was oddly satisfying way to close our evening. In the end, from City Beer Store to Specs’, we walked a short 4.5 miles. Adding in the walk to and from our hotel, Merideth and I walked close to 7 miles. Not bad for a day’s beer drinking. Thanks again Chris! Great hiking with you, Merideth, and Renee. After Specs', other Chris and I went looking for Owls, then had one last pint at Dave's, where I walked out on my tab like the drunk moron that I am. All day, I biked about 11 miles and hiked about 9 before collapsing in my bed at the Mosser Hotel. Next up: my epic, wet Sunday trek with The Beer Retard.